There’s a lot of construction underway at the University of Delaware. The future home of the National Institute for Innovation in Manufacturing Biopharmaceuticals (NIIMBL) and the Chemours Discovery Hub, a state-of-the-art center for research and development, both to be located at UD’s STAR campus, are expected to be completed in 2020. Many alumni from UD’s College of Engineering are involved in building the future of UD, and by the time UD is ready for its next construction boom, the construction industry will have a new class of leaders. That’s because UD’s construction engineering and management program, a one-of-its-kind offering in the Mid-Atlantic region, is off to a very strong start. The program, launched in fall 2017 through the civil and environmental engineering department, is built on a deep history. Civil engineering is the oldest engineering major at UD — dating to 1889. For Edgar Small, director of UD’s construction engineering and management program and an associate professor of civil and environmental engineering, the highlight of the year has been the enthusiasm of the program’s supporters. The first class of students is thriving, and Small predicts that there will be about two dozen sophomores in the program this academic year. Student Brendan Daly looks out over the construction on UD’s STAR campus. Tomi-Lynn Paolino, a sophomore from Freehold, New Jersey, joined the construction engineering and management program because she envisions her future in the field. Paolino has an affinity for — and aptitude in — math, a critical subject for construction engineers, who calculate forces on structures and much more. As a second grader, Paolino would finish all of her math homework for the week on Monday night. By eighth grade, she was moved a year ahead of her peers in math classes and often tutored her classmates. Paolino has also had lifelong exposure to the construction industry through family connections. Her dad owns a masonry company and often used their home and backyard to test new ideas. “I want to love what I do but also earn a good salary,” she said. The median salary for a construction engineering manager is $88,505, according to PayScale. A.J. Richardson, a sophomore from Mount Royal, New Jersey, has always dreamed of building sports stadiums. The student manager of UD’s baseball team, he has toured several baseball facilities and always found himself fascinated by the structures and designs. “When I was younger, I would take random things and put them together to make something new,” he said. He spent last year’s Thanksgiving break helping his younger sister make a toy for their cat out of wrapping paper rolls and string. 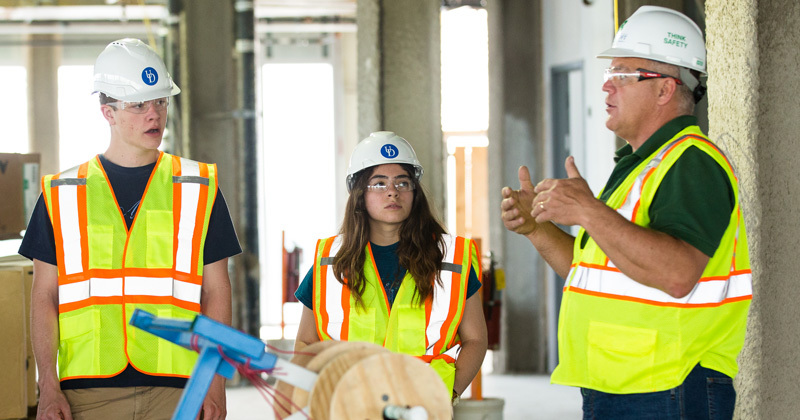 Students in the construction engineering and management program benefit from the generosity of alumni and organizations that support construction education. Doug Gianforte, president of GBuild Construction Managers, based in Exton, Pennsylvania, graduated from UD in 1984 with a civil engineering degree. During an internship with the Delaware Department of Transportation (DELDOT) during college, Gianforte realized that he wanted to pursue a career in construction. After graduating from UD, he started working for a major national construction group, and now, he runs a firm that builds and renovates facilities for a variety of industries, including higher education. GBuild has completed over 100 projects at UD, including renovations to Perkins Student Center and civil engineering laboratories in DuPont Hall. Gianforte said the construction engineering and management program at UD gives students ideal training for careers in the industry. 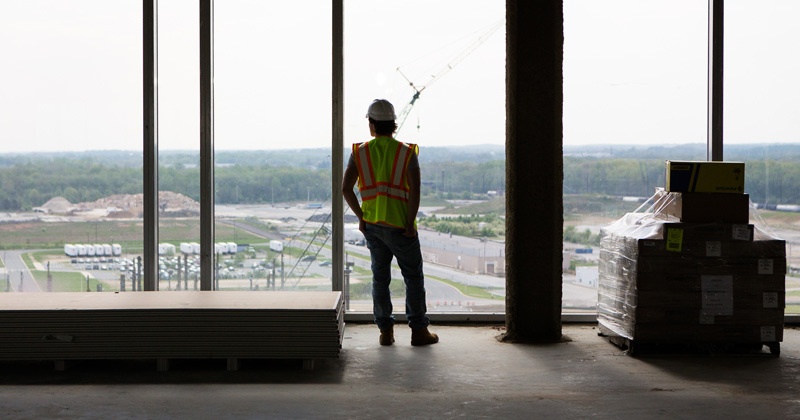 The construction engineering and management program offers students engineering foundations, modern construction techniques such as building information modeling, and business essentials. A required co-op ensures that students will graduate ready to make their mark. Through an optional winter session study abroad session in Dubai, home to the world’s tallest building, students can learn about international construction and project management. Two construction engineering and management students spent the summer of 2018 as research fellows, studying the use of drones in construction. As drones fly around a site, they collect data on a project’s progress — such as how many bricks are being laid each day. “Drones can help people like me better estimate costs for construction projects,” said Gianforte. He and his wife, Jan Gianforte, a 1984 UD graduate, sponsored the summer researchers. Doug Gianforte is not the only executive taking notice of the program. A construction engineering and management kickoff event in February 2018 attracted local construction industry influencers, who talked with students about the opportunities this degree could open for them. Bob Aydukovic, president of the Maryland Center for Construction Education, noted that companies in the state of Maryland need to hire about 1,000 construction industry professionals per year, but there is a short supply. Many come from Pennsylvania or Virginia.